Place cookie sheet on oven rack. Heat oven to 375°F. Let 1 crust thaw 10 to 20 minutes. Prick bottom and around side thoroughly with fork. Bake on cookie sheet 9 to 11 minutes or until very light golden brown. Meanwhile, in 10-inch nonstick skillet, heat oil. Add onion; cook 4 to 6 minutes, stirring frequently, until soft and beginning to brown. Sprinkle ham, cheese and onion into partially baked crust. In medium bowl, beat half-and-half, eggs, salt and pepper with whisk until blended. Pour into crust. Bake on cookie sheet 25 to 30 minutes or until knife inserted in center comes out clean. Let stand 10 minutes before serving. Cover and refrigerate any remaining quiche. Sweet onions come from many regions, but Georgia is the proud home of the Vidalia onion, the state's official state vegetable! 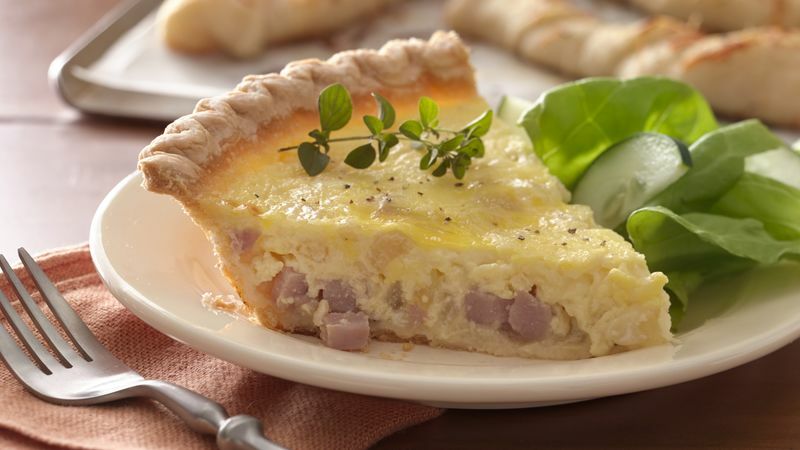 Serve this delicious quiche for breakfast, brunch, lunch or even supper. Add a fresh green salad and crusty breadsticks for a complete meal.